Our friend Tonya Stofflet needs help. Last year after she received some money from her parent's estate, her ex-husband talked her into paying off the passenger van she was driving and if she did he would transfer it to her name. Tonya went ahead and paid the van off but unfortunately her ex-husband did not transfer it to her. Instead today unexpectedly he actually took the paid off van and left her without transportation. He even took all the car seats with him. In case you do not know, Tonya has 6 children under the age of 9. 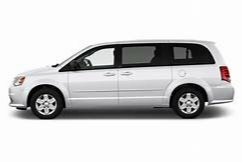 While I was looking for a van I asked a few people questions about possible van options and along with answering my questions they also said they wanted to help. I am starting this page with the intent to offer others the same opportunity to help. Tonya is currently without transportation and now dependent of other to take her the children to their activities and appointments. This is not sustainable and we want to get her reliable transportation and new car seats for the children. If you know Tonya, you know that she is the one of kindest souls on earth and she would appreciate all the help we can provide. I personally would be very grateful for your generosity and I commit to paying for whatever amount needed that we do not raise.